It happens when you do nothing more than quickly shut off a faucet. BANG! It sounds like a shock wave just went through your pipes! You may even see faucets and other plumbing fixtures vibrate when this happens—that's how forceful the impact is. This phenomenon is called water hammer for a good reason (technically, it is known as hydraulic shock). The water sends a shock wave that can exert pressures at hundreds of pounds per inch. Water hammer is annoying but also can damage your plumbing system. Your water supply pipes may already include old-school solutions for water hammer (and you can "recharge" this system, if necessary), but chances are that the best fix will be to install water hammer arrestors. Water hammer (hydraulic shock) is by far the loudest and most common plumbing noise problem in the home. It occurs when a faucet or appliance quickly shuts off the flow of water into the fixture or appliance, causing a shockwave that makes the water supply pipes bang against each other or against wood framing members (wall studs, floor joists, etc.). Water hammer can be caused by any fixture or appliance that uses water, but some of the most common culprits are clothes washers and dishwashers. These typically have solenoid valves that shut off the flow of water very quickly, so the water flow goes from fully on to fully off in a split second. Water supply systems in older homes may have pipe fittings called air chambers located on each hot and cold water line at or near each faucet or water inlet valve. These chambers are rarely visible, except in unfinished spaces such as a utility room. Otherwise, they are hidden behind walls along with the other plumbing pipes. The purpose of the air chamber is to act as a shock absorber for water when it is flowing at high speed under pressure. Since air compresses (it's a vapor) and water doesn't, the air chamber serves as a shock absorber, accepting the force of the water screeching to a halt when a faucet is turned off quickly. The shock wave hits the compressible air rather than slamming against the pipes. Air chambers are often fabricated on-site by the plumber and installed just before the faucet's water supply pipes reach the faucet. They typically consist of a vertical length of capped pipe about 12 inches long or longer and are the same diameter as the water supply pipe. The problem with these makeshift air chambers is that they can fill up with water over time, eliminating the air that serves as a shock absorber. You can recharge water-filled chambers by shutting off the water supply and draining the pipes. This allows air to fill the chambers again, which gets trapped there when the water is turned back on. If this solution isn't effective, try installing water hammer arrestors. Usually, the best long-term solution for eliminating water hammer is to install a water hammer arrestor on each water supply line that makes noise. A water hammer arrestor works much like an old-style air chamber but it includes an air- or gas-filled chamber that is sealed by a diaphragm or piston. The diaphragm or piston moves to absorb the shock of the water, while keeping the water and the shock-absorbing air or gas separated. Turn off the water supply to the washing machine, toilet, or dishwasher, using the shutoff valve(s) near the appliance or fixture. A washing machine has two shutoff valves (one for hot and one for cold); a toilet has a single valve on a cold-water supply pipe; a dishwasher has a single valve on a hot-water supply pipe. Turn the valve handle all the way clockwise (or perpendicular to the pipe, for lever-type handles) to shut off the water between the valve and the appliance or fixture. Place a bucket or towel on the floor to catch spilled water. Disconnect the water supply tube or hose from the appliance or fixture or from the shutoff valve. 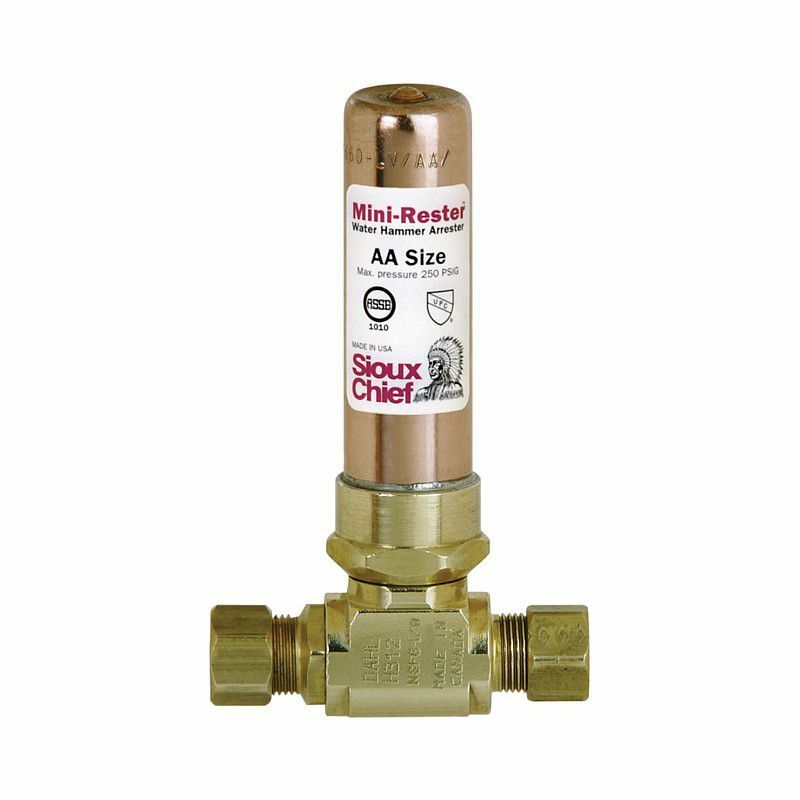 Water hammer arrestors can install onto the appliance or fixture inlet or onto the outlet of the shutoff valve, but it's best to install them as close to the appliance or fixture as possible. Use tongue-and-groove pliers, if necessary, to loosen the hose fitting. Or, use an adjustable wrench to loosen the compression nut connecting the supply tube to the shutoff valve. Wrap the exposed male threads of each shutoff valve outlet or water inlet (depending on where you disconnected the supply hose or tubing) with plumber's tape ("Teflon" tape or thread-seal tape). Wrap the tape three or four times in a clockwise direction. Also, wrap the male threads on each water hammer arrestor. Thread a water hammer arrestor onto each valve or inlet, turning the female fitting in a clockwise direction until it is hand-tight. If you're working with a compression fitting on a dishwasher or toilet supply valve, fit the arrestor tube into the compression fitting, slide the compression ring against the valve, then thread on the compression nut. Tighten an arrestor fitting with tongue-and-groove pliers; tighten a compression nut with an adjustable wrench. Connect the water supply tube or hose to each water hammer arrestor and tighten the connection with pliers or a wrench. Turn on the water supply at the shutoff valve, turning the handle all the way counterclockwise to open the valve completely. Run a cycle in the washing machine or dishwasher, or flush the toilet, to test the water hammer arrestor(s). Check all connections for leaks, and tighten as needed with the pliers or wrench.